A single serving of some fruit drinks may contain an entire day's sugar allotment for a child, new research claims. In a joint study undertaken by the U.K.'s University of Liverpool and Action on Sugar, researchers analyzed the sugar content of 200 juice drinks, 100 percent fruit juices, and bottled smoothies that were marketed to children. They calculated the amount of “free sugar” in each drink, which was defined as sugars added by the manufacturer—including glucose and fructose—as well as sugars in items like honey or syrups. However, they did not include natural sugars found in whole fruits and vegetables, which the body metabolizes differently and which act to curb energy intake. The results showed that nearly half of the beverages contained a full day’s recommended maximum amount of sugar for a child, which in the United Kingdom is 19 grams or almost five teaspoons. 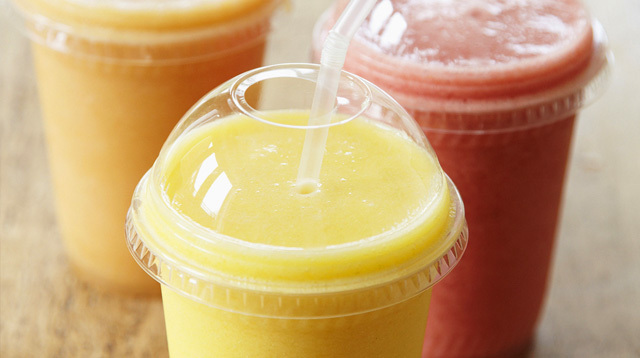 “Increasing public awareness of the detrimental effect sugar-sweetened drinks have on kids’ teeth and waistlines has prompted many parents to opt for seemingly healthier fruit juice and smoothie alternatives," said Professor Simon Capewell. Professor Capewell added that people make the mistake of believing that smoothies are healthy but in reality some of these drinks had up to eight teaspoons of sugar in the standard serving. One of the main differences between eating a whole fruit and drinking it as a juice is that healthy fibre, which helps slow the body’s absorption of sugar, is lost during processing. While many of the juices used artificial sweeteners without any calories, the researchers were also sceptical about how great of an improvement that is for kids’ drinks and didn't think it will provide a long-term solution to reducing sugar consumption and subsequent health problems. They added that eating whole fruits and vegetables remains the best option. The research was first published in the BMJ Open journal.